Skip that long drive to Pochampally and head out to Koti instead to get the latest trends in ikat and Pochampally. Plus, the prices aren't exorbitant and match the ones at Pochampally. 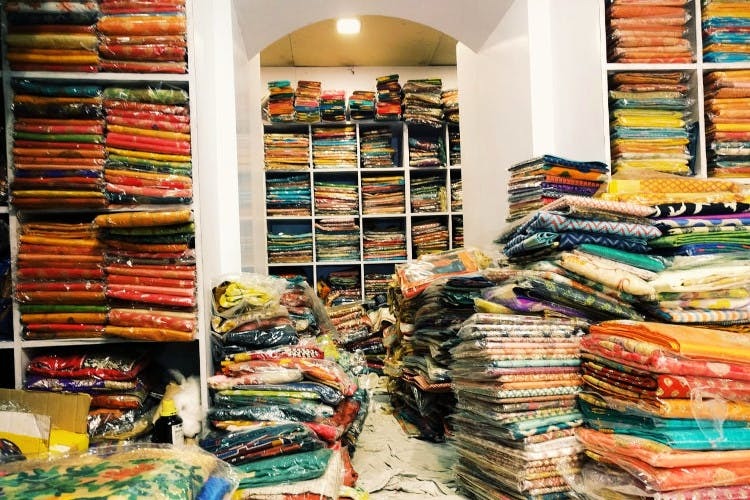 Thunga Swamy Silks is an 80-year-old fabric and readymade emporium that sources fabrics, sarees, and dress materials from Pochampally as well as Kancheepuram and other Indian towns. This store is known to serve its patrons even before India's independence and its major specialty lies in Pochampally silks. We decided to check out this store, which comes with high recommendations from our aunts, moms, and grandmas (Whaaaat!). So, let's check what we found? We are all familiar with how ikat is trending, but honestly, aren't you tired of spotting similar designs and colours everywhere? We sure are! When we asked to fish out some ikat dress fabrics, the store gave us brilliant colour options. Right from peacock greens and sunflower yellows to subtle beige and furious reds, they have stocked up on plenty. We were told that the owner handpicks the ikat and Pochampally sarees at Pochampally himself. The sarees are priced at around INR 3,500 and upwards while the fabrics (For a dress) are priced at INR 700-2,000. There are plenty of kalamkari fabrics (INR 150 per metre), silk sarees from Kancheepuram which are slightly on the expensive side along with chiffon and georgette fabrics and sarees. But our heart goes out to the clothing from Kancheepuram and Pochampally.